Recorded in September 1985. 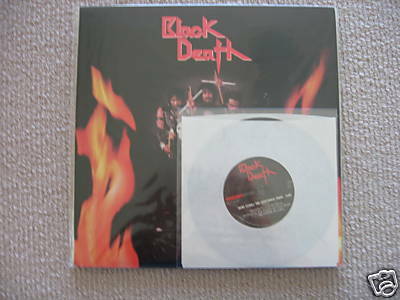 The EP was officially released as a 12″ limited to 100 copies. 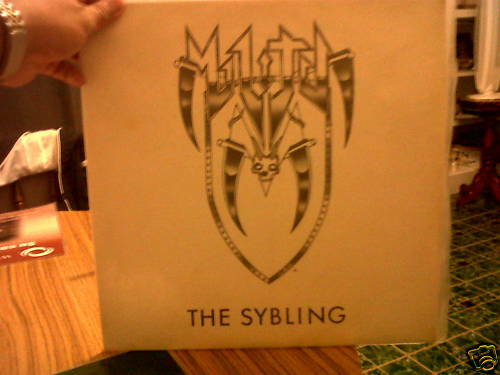 Bootlegged on 7″ sometime in the early ’90s. 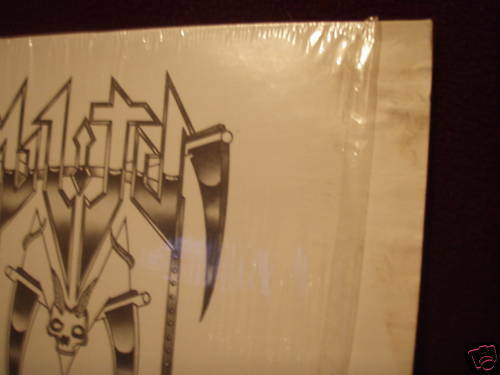 One of the most sought after metal collector items, the original has sold for $3000 and even the bootleg goes for over $50. 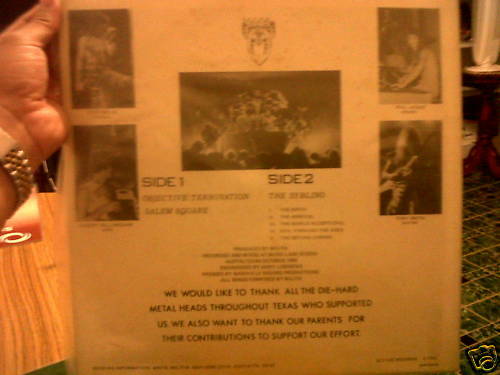 Also bootlegged on a split CD by Revenge of True Metal Records. 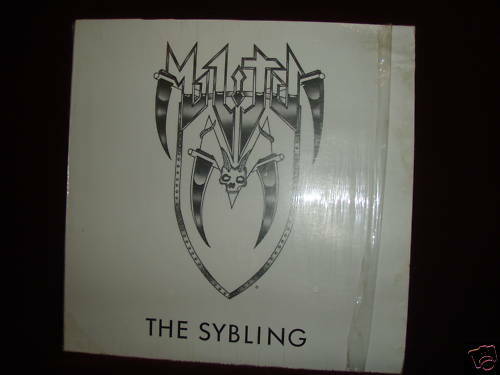 Like most copies of THE SYBLING, this one is from San Antonio, Texas so it’s from the area that the band started in. The two pictures above are from the seller and the album looks like a legit copy. 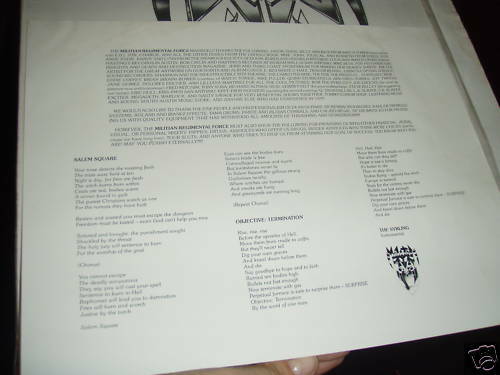 The seller also listed four other pictures: the lyric sheet insert, the vinyl, and two pictures of the himself with the record with the band from 2008. My only problem with the auction is that the seller has a zero feedback rating and is generally new to Ebay. A zero feedback rating always puts up a red flag to me but, as everything on Ebay, it’s “buyer beware” so hopefully the transaction goes smoothly. The album started at 99 cents and went up over $2200 within 24 hours! I don’t know who the winner is but I’d love to know how someone spends $2550 on a 3 song/15 minute E.P.! As a side note, Rockadrome Records has released a compilation CD from Militia titled RELEASED (2008) that includes 2 early demos, THE SYBLING, and a couple of outtakes and live tracks. If you want to own all that Militia has recorded, including this E.P., then save yourself $2537 and spend the $13 on the new CD. Ebay Madness: Kidd Wikkid – s/t (1992) strikes again! Just when you thought it was safe again on Ebay, the Kidd Wikkid CD strikes again! 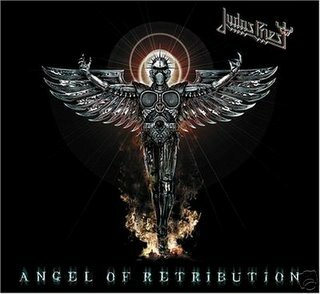 I’ve featured this CD twice before: October 2006 when it sold for $394 and June 2007 when it dropped to a mere $232.48! Everytime I come across this CD I always see it go for big dollars, even for bootleg CDRs! So here we go…..the latest Ebay Madness on Kidd Wikkid. This seller is from the U.S. with 100% positive feedback and the auction lists verified questions from bidders as to the authenticity of the CD (sliver-pressed original or bootleg) so there are a lot of positives. For collectors, an original pressing is still a rarity but buyer beware of all the bootlegs that are damn close to an original. This auction got out of hand early: by Day 2 of the auction it was already over $200 and by the next to last day it was over $350. Kidd Wikkid – s/t (1992) sells for $513 a week later! 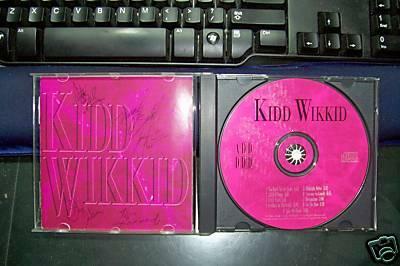 Second Kidd Wikkid CD out of Montana in a week but this one is extra special…..it’s autographed! The owner of this autographed copy owned a music store in Butte and he was given an autographed copy by the band for his store. He says he may have a t-shirt also and, if he can find it, will throw it in! $513 for a CD and a t-shirt…..I wish I could spend that kind of money. This Razor CD auction started on April 4th and was sold April 5th when a “lucky” buyer decided that $250 was a fair price (for an original mint CD on Fringe Records) and bypassed the auction process starting at $10. 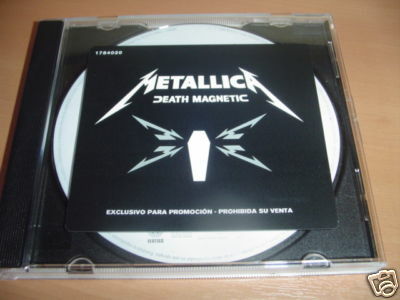 The seller is from the U.S., offered decent shipping and a guarantee that the CD was mint and an original. I could tell by the auction description that the seller knew a thing or two about collecting because he makes it very clear that this CD was not a bootleg, reissue or a Greek and/or Russian pressing. 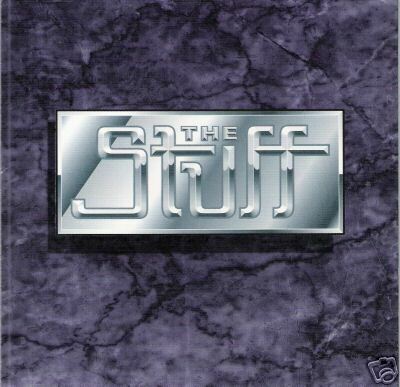 With the market price now set at $250 the day before, this seller from Sweden had an original near mint copy of the same CD on Fringe Records starting at $9.99 up for grabs. Turns out that there are a lot of people looking for an original pressing of this album because 66 bids later this one sold for 5 bucks more! This was an actual auction so if you look at the bid history there are really only 6 actual bidders and the winner is the one putting in astronomical amounts. All the power to him for wanting to pay big money! What I did notice is that while the bidding war was going on here for a full week, the BUY IT NOW auction above started 5 days after when the price got high. This auction at $255 ended early on April 6th. 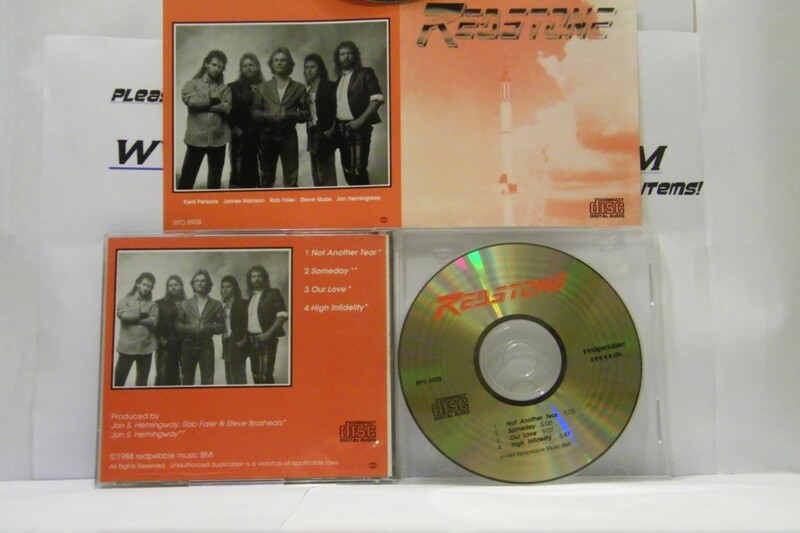 And while the two auctions above were selling in excess of $200, here is this Razor CD listed for $199.99 with BUY IT NOW…..a “bargain” at $50+ less than the going rate! I have to give the seller on this auction some kudos because he ended this auction a few hours after the $255 CD ended. Why sell your CD for less when you can hopefully get top dollar? The seller here states that he is a former record store owner and Metal fan and that he used to order an extra copy of everything so he could add to his personal collection. Sounds like something I would do! He also makes reference to the auctions above in his listing and calls out to the people involved in the bidding war…..maybe he got an offer? Who knows but he’s sitting on a CD that’s in demand. 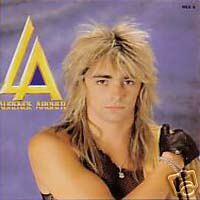 Maybe the former record store owner ended his auction because he saw this CD sell for $180+ less? This Razor CD is located in Russia and the seller has 100% positive feedback and provided four detailed photos of the CD. This one was also listed the day of the bidding war and it was scooped up quick at a real bargain price! 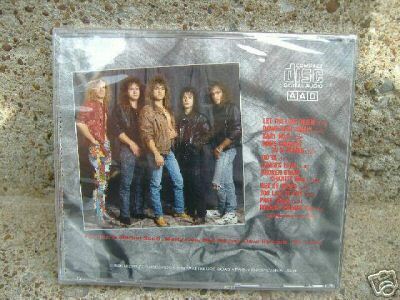 If you’re interested in owning an original CD pressing of this Razor album then there is a current auction from a seller in Greece that’s waiting for you to bid……it’s only up to $45 USD as of this post! I have this CD! Picked it up years ago from a top collector for about half the price. 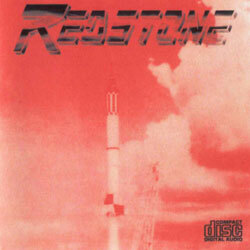 This Russian AOR disc gets bootlegged often, copies flood Ebay and eveyone gets to hear it. To find an original is hard to do, only 300 copies were made. I did my research years ago and did in fact get an original. Speculation is that either the label keeps pressing the discs or one of the band members is doing it. 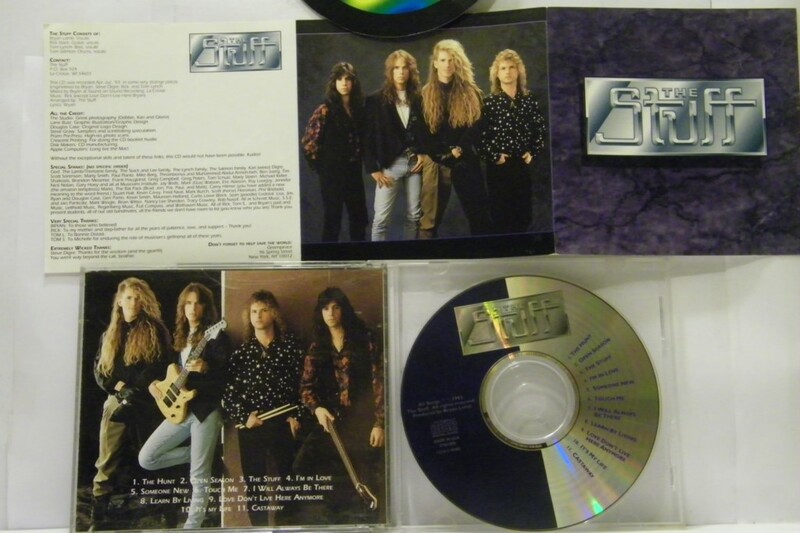 This CD sold for $270 back on March 1st and now here’s another one. I know nothing about the band except that they are from Minnesota and play Hard Rock. I’ll bet that there is someone on the Net with a few copies and they are getting sold to collectors. The first auction in March was sold by a respected collector, this auction was done by an up and comer that I have bought from in the past. Kudos to eagleyeiii for getting two big auctions in the same column! Airbourne – Ready To Rock (2004) sells for $410! Everyone should have picked this CD up when Airbourne was still a bar band and copies could be had for $10-$15 plus postage. This is the second one I’ve seen in the last couple of months go for big money, both signed by the band. These discs were only sold at local shows in Australia.